Delta Kappa hosts a variety of events for our national philanthropy, which is Breast Cancer Awareness and Education. Our current philanthropy chair and chapter members work together to help make these annual events possible! Catwalk for a Cure is Delta Kappa’s new fall philanthropy event. Catwalk for a Cure allows women in the Greek community at LSU to be styled by local boutiques and walk in a fashion show with their fellow sisters and other Panhellenic women. The show also features survivors including the Delta Kappa house mother, aunts, and mothers of our chapter members. Pancake Breakfast is Delta Kappa’s annual Spring philanthropy event. 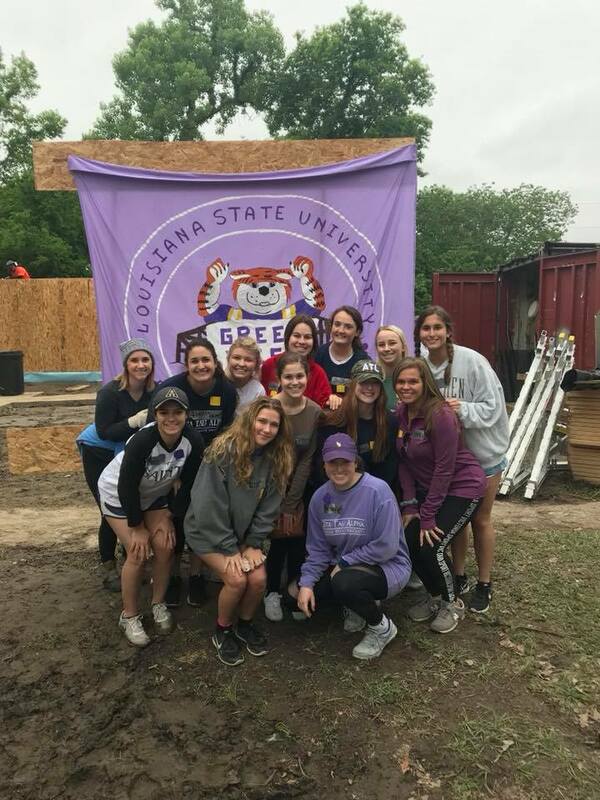 For the past 12 years, Delta Kappa has opened their house to the Greek, LSU and Baton arouge communities for a twelve-hour long pancake breakfast. In the past, there have been silent auctions with amazing trips, local bands, and of course walls dedicated to warriors of breast cancer. In the spring of 2018, Delta Kappa raised $20,000 for our philanthropy. Since ZTA is partnered with the NFL, Delta Kappa members join together with fellow ZTAs, in both collegiate and alumnae chapters, to pass out pink ribbons and information cards before and during the New Orleans Saints' "A Crucial Catch" game in October. Each year, tens of thousands of Saints fans receive critical breast cancer information and learn more about the disease because of ZTA's efforts. Another annual event that we are a part of is Making Strides. Making Strides is with one of our national partners, the American Cancer Society. At Making Strides, we were in charge of running the survivors tent. It is so rewarding to work side by side with your sisters and see the difference you are making in other people's lives. Not only did we run the survivors tent and get to interact with the survivors, but we also got to cheer on the participants as they finished the walk! One of my favorite parts about Zeta is how we are able to work hands-on with the people we are raising money to help. We are looking forward to working with Making Strides next year and help make it the best it can be! Delta Kappa doesn't just participate in service for breast cancer awareness and education. Every year our service varies, ensuring we volunteer our time to a number of different causes and always keeping it interesting! Zetas frequently volunteer at the Companion Animal Alliance Shelter, a local soup kitchen, the Baton Rouge Food Bank, writing letters and sending care packages to our service men and women, collecting cans for the Second Harvest Food Bank of Baton Rouge, volunteering for Boo at the Zoo in Baton Rouge, making Valentine's Day pillows for cancer patients, and volunteering at Knock Knock Children’s Museum. We are always open to new ideas for service opportunities, and we love to get involved in the Baton Rouge community.